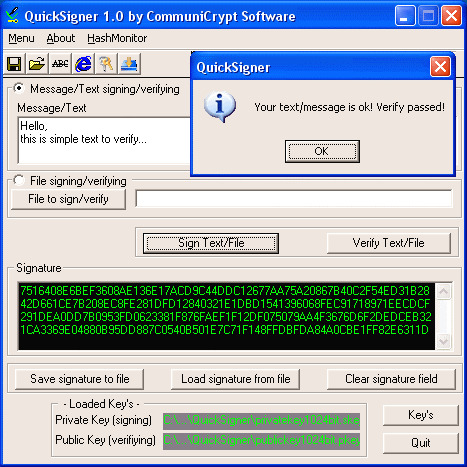 ecure your data exchanges and transfers with digitally signed files!This is a tool for quickly digitally signing or verifying text or files with Public-Key-Encryption with RSA encryption algorithm (RSAES-OAEP).Key length for signing up to 7120 bit. Keys are compatible with CommuniCrypt Standard Edition. You sign a file or text with your secret key, send this via LAN, Internet or mail and the other side can verify the authenticity of it with your public key. Quickly and secure! A "must have" for all!